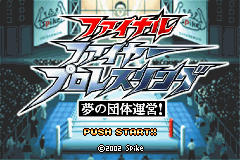 Final Fire ProWrestling: Yume no Dantai Unei! If, while playing this game, it all looks familiar to you, it’s because it was released stateside as Fire ProWrestling 2. Except, whoever released it over here took out the story mode. Why? So now you’ve got exactly the same game as the first one, with a few new moves and even fewer new players. Wowee. So yeah, this game has a story mode, where you have control over your own wrestling federation. Sounds pretty awesome.